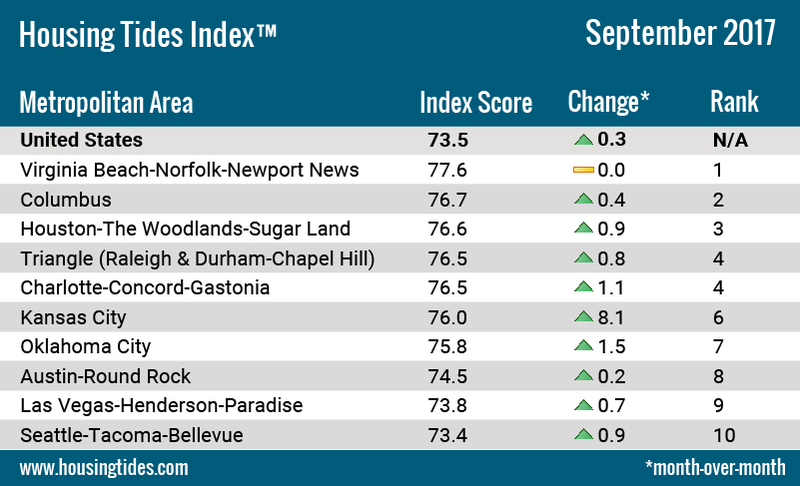 The Housing Tides Index™ increased for the second straight month in September, reaching a value of 73.5 following August’s reading of 73.2. This month’s Index value is unchanged from a level of 73.5 in September 2016. The number of homes listed for sale is at its lowest level for any July since 2013 and this dearth of inventory surely contributed to the widely-publicized drop in new and existing home sales recorded in the month. 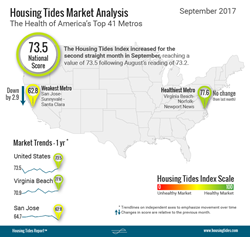 This week marks the release of the September Housing Tides Report™, featuring an update to the Housing Tides Index™, an objective and sophisticated approach to quantifying and comparing the health of U.S. housing markets. This month’s Index update reveals an improvement in housing market health as 30 of the 41 markets tracked by Housing Tides saw improved conditions. After exceeding our expectations and reaching a ten-year high in June, single-family permit approvals fell by over 16% in aggregate across the metros we track in July with just 35,400 permits approved. Multi-family permit approvals fell considerably as well, dropping by over a third in July and pulling the six-month moving average down to a rate of 23,700 per month. Please reference the attached graph to view the Ten Healthiest U.S. Housing Markets - September, 2017.